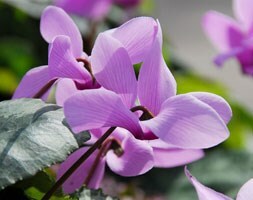 Position: partial shade Soil: well-drained soil Rate of growth: average Flowering period: September to November Hardiness: frost hardy (may need protection in winter) Bulb size: 13/15 Slender pale to rose pink flowers give this pretty cyclamen a more delicate appearance than many of the other species. Made up of five twisted and recurved petals, which have a magenta blotch at their mouth, the nodding flowers appear at the same time as the foliage in autumn and usually last for several weeks. The mid-green leaves are heavily patterned with silver on the upper surface and have a purplish sheen underneath, and these will remain attractive throughout the winter before dying back in spring. Originating from coniferous forests in Southern Turkey where they are found growing amongst rocks and screes, they prefer a sheltered spot with freely draining soil in partial shade. Garden care: Plant the tubers shallowly with the rounded (usually smooth) side downwards so that the top of the tuber is either at or just below the surface of the soil. Water moderately while they are actively growing, but reduce this as the flowers fade. When the leaves die back in spring, apply a generous layer of mulch and keep the tubers as dry as possible during their summer dormancy. Position: full sun Soil: poor to moderately-fertile, well-drained, neutral to alkaline soil Rate of growth: average to fast-growing Flowering period: February to July Hardiness: fully hardy The leafy stems of this shrubby evergreen are crowned with 4-petalled scented flowers, which open over several months from lare winter or early spring. 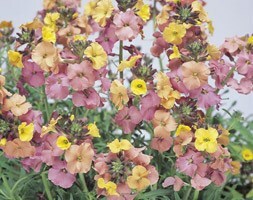 Initially cream, the flowers change colour as they mature, first turning yellow, then apricot and finally pink. They are good for cutting andwill help attract pollinators. Garden care: Requires little attention. Provide cloche protection where frosts are very severe or prolonged. 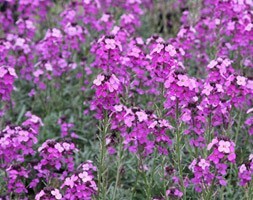 Position: full sun Soil: poor to moderately-fertile, well-drained, neutral to alkaline soil Rate of growth: average to fast-growing Flowering period: February to July Hardiness: borderline hardy ( may need winter protection)) This long-flowering, bushy, vigorous wallflower produces long spires of deep mauve flowers from late winter to summer (and usually into autumn), above narrow, grey-green leaves. 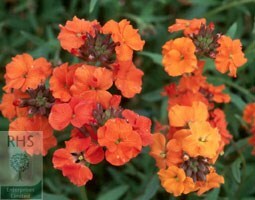 It is a short-lived plant, but it makes a vivid display for many months in a sunny border. Try it as part of a colour-themed scheme, or contrast it with vivid yellows. It also looks good in a rock garden or raised bed. Garden care: Requires little attention. Provide cloche protection where frosts are very severe or prolonged. Position: full sun Soil: poor to moderately-fertile, well-drained, neutral to alkaline soil Rate of Growth: average to fast-growing Flowering period: March to June Hardiness: fully hardy From spring to midsummer dark burgundy buds open to reveal lightly scented, apricot-orange coloured flowers. These flowers appear on erect racemes which open from the base and become elongated throughout the flowering season. Garden care: Requires little attention. Provide cloche protection where frosts are very severe or prolonged. Position: full sun Soil: moderately fertile, well-drained, neutral to slightly alkaline soil Rate of growth: average Flowering period: June to August Hardiness: fully hardy A tumbling mass of bright pink, five-petalled flowers appear on hairy stems from June to August. This low-growing, evergreen perennial is perfect for the front of a sunny, well-drained border, rock garden or raised bed. Since it actually prefers neutral to slightly alkaline soil it’s a good choice for a site recently cleared of builders’ rubble. Garden care: Lift and divide congested colonies in autumn or spring. 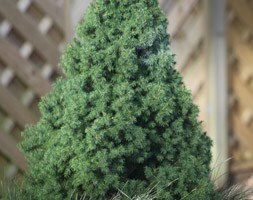 Position: full sun Soil: deep, moist, well-drained, neutral to acid soil Rate of growth: slow-growing Other features: ash-grey bark Hardiness: fully hardy Perfect for a short-term, table-top Christmas tree, this conifer may not come as a perfect pyramid, but it looks charming, especially when adorned with decorations, lights or tinsel. Try to keep it in a cool, bright room and move it outside as soon as possible after Christmas, where you can enjoy it for the rest of the year. 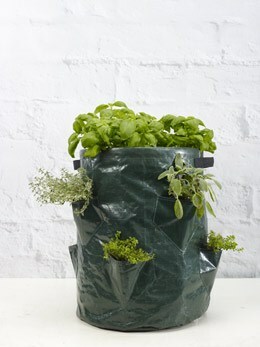 It is currently around 60cm tall (including the pot) and has beautiful, blue-green, needle-like leaves. As it matures it will also produce oval, green summer cones that age to brown. A slow-growing, broadly conical, evergreen conifer is an excellent specimen tree for a small, sunny garden. Best in moist, well-drained, neutral to acid soil or ericaceous compost if you wish to keep it in a pot. Garden care: To maintain the plant’s distinctive shape remove any misplaced or diseased branches in winter. 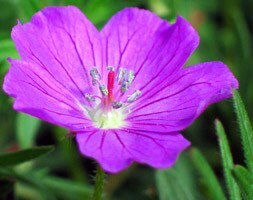 Position: full sun Soil: humus-rich, moist but well-drained, neutral to slightly alkaline soil Rate of growth: average to fast-growing Flowering period: August to October Flower colour: white Other features: lobed, dark green leaves Hardiness: fully hardy Large, single, white mallow-like flowers up to 12cm across with a lacy centre from August to October. 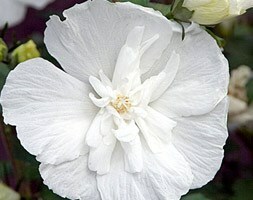 This tree hollyhock is ideal towards the back of a sheltered, sunny border. Vigorous and easy-to-grow, it’s one of the best varieties for cooler areas of the country, since the petals stand up well to wind and rain. Garden care: To encourage a bushy habit prune young plants hard in late spring. After pruning apply a generous 5-7cm mulch of well-rotted garden compost or manure around the base of the plant. Once established it requires little if any regular pruning. 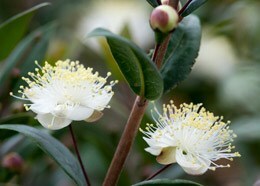 Position: full sun Soil: fertile, moist, well-drained soil Rate of growth: average Flowering period: July to August Hardiness: frost hardy (needs winter protection) This small-leaved myrtle has deliciously scented, large, pink-tinted cream flowers in summer offset beautifully by glossy, dark green leaves. The flowers are followed, in autumn, by white berries. More compact and rounded than the species plant, it is a great choice for a sheltered, sunny spot in the garden. Garden care: Protect from cold, drying winds. Apply a 5-7cm (2-3in) mulch of well-rotted garden compost or manure around the base of the plant in early spring. Remove any unwanted growth in late spring.